Henry Clay Miller (1844-1920), 1481 Broadway, New York; c/o Robert Goodbody & Co., 35 Broad Street, New York. He was born in Philadelphia, Pennsylvania, on May 19, 1844, the son of George H. Miller (1818-1888) and Emma M. Stellwagon Miller (-1855). He was a student of Samuel M. Cleveland studying with him as a college prep student. In 1864, he entered Williams College, Williamstown, Massachusetts (founded 1793) and was a graduate in 1867. His graduation speech was on aesthetics, “The Perception of Beauty”. His closest friends from school were John H. Jones, Hamilton Mabie and Francis Lynde Stetson. He taught at the Lake Forest Academy, Illinois from 1867-1868, under principal L. M. Johnson. He left the Academy and became a chemist at Philadelphia from 1868-1871 beginning in the lab of Dr. Bruckner. But, for the next three years he was the principal of Miller & Cummings and worked with his old school chum Jones in the business of importing drugs and sundries. Due to poor health he retired for eighteen months (1871-1873) in the Rocky Mountains engaging in mining. 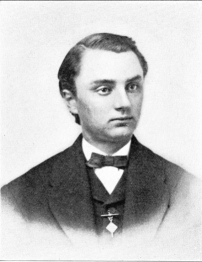 He returned to the Lake Forest Academy, Illinois for one year term (1873-1874). From 1874-1875, he taught at the Trenton Normal School, Trenton, New Jersey, teaching Latin and German. From 1876-1886, he was one of the three directing principals of the Hasbrouck Institute, 109 Grand Street, Jersey City, New Jersey, founded in 1856. Although he continued in the Hasbrouck School from 1881-1886 he sold off his interest in the School in 1881. On December 24, 1878 he married Effie Wilkes. She died on November 1880. From 1881-1887, he was one of three directors of the New-York School of Languages, 1479-1485 Broadway, near 43rd Street, New York. From 1889, he was a principal with Arthur Williams of the Dwight School, New York, 1481 Broadway, corner of 43rd Street, where he was one of the founders in 1880. The school is a college preparatory school with graduates at Yale, Harvard, Columbia and Williams Colleges for science or business. Miller retired from teaching and school administration in 1895. From 1895 on he became an investment financier and stockbroker in New York with Goodbody & Co., and amassed a fortune. He was a member of the British Numismatic Society in 1903. He was a member of the American Numismatic Society, and the New York Numismatic Club. He applied for membership to the ANA in October 1902. He was a numismatist famous for his attribution guide of Colonial Connecticut coppers, 1785-1788. He collected ancient Roman, Anglo-Saxon as well as American and the other American colonial coin series. He discovered and bought for less than $50 a pair of proof 1796 US Half Cents in London. Sometime between 1900 and 1910 he moved from New York to Ridgewood, New Jersey. He was 5'-10" with hazel eyes and since about 1910 he was partially bald with gray hair. Thomas Elder describes his physical appearance as fat and rotund figure and implied that was the result of his voracious appetite for candy. He used to give Lyman H. Low small consignments to sell, and later on transferred his sale trade to Thomas Elder. His collection was sold by Lyman H. Low on June 15, 1897. He traveled to Egypt returning in March 1907. Another sale by Thomas Elder on April 13-14, 1917 had 54 varieties of 1794, five of which, had been plated in Gilbert-Elder. He died in a Hospital from a heart attack on February 5, 1920, after five days of intensive care. He is buried in Laurel Hill Cemetery in Philadelphia. His sister Miss Emma Miller was instructed by him to give Thomas Elder his remaining collection to sell. Miller, The State Coinage of Connecticut. Thomas L. Elder, Catalogue of the Miller Sale May 26-29, 1920, and a separate special plate catalogue. The Numismatist, September (1920) : 407 announcement of publication.